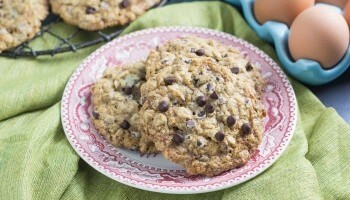 This cookie is halfway between a regular chocolate chip cookie and a typical oatmeal cookie. 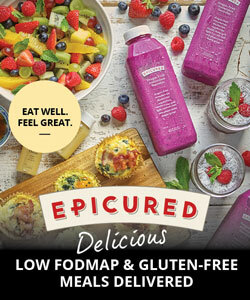 They are sublimely chewy and perfect for dunking into a glass of lactose-free milk. Position racks in upper and lower third of oven. Preheat oven to 325F/165C. Line 2 cookie sheet pans with parchment paper. In a large bowl whisk together the melted butter and brown sugar until blended. Whisk in the vanilla and eggs until the mixture is smooth and well combined. Use a sturdy wooden spoon to stir in the oats, flour, baking soda and salt until blended. Stir in morsels, and nuts if using. Drop cookie dough by generously rounded tablespoons 2 inches (5 cm) apart on cookie sheets; flatten cookies slightly. Bake for about 10 to 12 minutes, rotating pans halfway through, or until edges and tops have just begun to turn light golden brown. The cookies will be a bit soft in the center. Place pans on racks to cool cookies completely. Store cookies at room temperature in airtight container for up to 5 days. 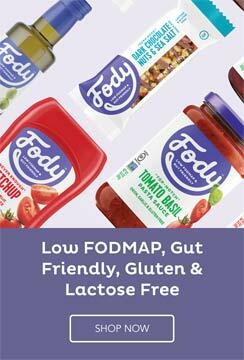 This exclusive recipe was created by Dédé Wilson from FODMAP Everyday®. 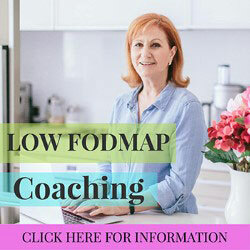 Find more delicious low-FODMAP recipes in her excellent 50 Certifiably Delicious Low FODMAP Recipes eBook.